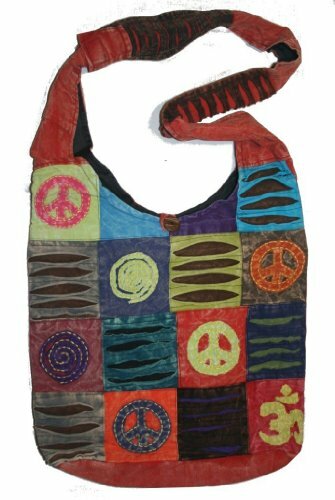 This gorgeous vibrant razor cut bag with Peace, Om and Spiral Patches all over is handcrafted by the skilled artisan of Nepal. It has a heavy duty metal zipper and a button to latch from outside to make this bag more secure. This bag has a inner pocket with metal zipper to keep smaller items. It is fully lined with black cotton fabric makes this bag more durable. It has a long and wide strap that keeps the bag rest on the hip to carry easily and comfortably. The strap has a cell phone compartment suitable for iphone or other phone. The strap has peace symbol printed on both side above the seam. The back side of the bag is plain solid color. These bags are individually hand crafted so each piece is unique and color and patches may vary slightly. The bag measures 15 inches wide and 13 inches tall. The shoulder strap width starts from 5.0 inches from the seam to 3.0 inches at the top folding. You can carry this bag to school or everyday purpose. Very beautiful and great workmanship. This bag is exclusively made for Agan Traders Customers. We request you to specify the color and we will do our best to ship you the same color. Gorgeous razor cut with Om, Peace & Spiral Patches. It is hand crafted by the skill artisan from Nepal. NOTE: NONE OF THE TWO ARE EXACTLY THE SAME. Please expect variation in color and patches. Approx. Size = 15" X 15" (center of the curve); Shoulder strap = 21 inches long; Strap width = 5 inches to 3 inches (Narrow down from seam to top folding).